A basal cell carcinoma (BCC) is a type of skin cancer. It is the most common type (> 80%) of all skin cancer (skin cancer incidence is < 1%) in the UK. BCC are sometimes referred to as ‘rodent ulcers’. The commonest cause is too much exposure to ultraviolet (UV) light from the sun or from sun beds. Basal cell carcinomas can occur anywhere on your body, but are most common on areas that are exposed to the sun, such as your face, head, neck and ears. It is also possible for a basal cell carcinoma to develop where burns, scars or ulcers have damaged the skin. Basal cell carcinomas are not infectious. Apart from a rare familial condition called Gorlin’s syndrome, basal cell carcinomas are not hereditary. However some of the things that increase the risk of getting one (e.g. a fair skin, a tendency to burn rather than tan, and freckling) do run in families. Most basal cell carcinomas are painless. People often first become aware of them as a scab that bleeds occasionally and does not heal completely. 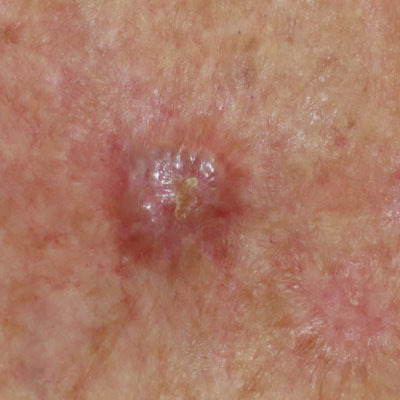 Some basal cell carcinomas are very superficial and look like a scaly red flat mark: others have a pearl-like rim surrounding a central crater. If left for years, the latter type can eventually erode the skin causing an ulcer – hence the name “rodent ulcer”. Other basal cell carcinomas are quite lumpy, with one or more shiny nodules crossed by small but easily seen blood vessels. Sometimes the diagnosis is clear from its appearance. If further investigation is necessary a small area of the abnormal skin (a biopsy) or all of the lesion (an excision biopsy) may be cut out and examined under the microscope. You will be given a local anaesthetic beforehand to numb the skin. Yes, basal cell carcinomas can be cured in almost every case, although treatment becomes complicated if they have been neglected for a very long time, or if they are in an awkward place - such as near the eye, nose or ear. Seldom, if ever, do they spread to other parts of the body.